This page will be limited to web shops offering next day delivery. As you can see when looking at the title this could sometimes include shops that offer guaranteed 48-hour delivery. The reason for this is that some web shops request an order to be placed before a specific time. When this is the case it is always shown next to the delivery cost. Although offering 24-hour delivery, late ordering could delay the delivery. The Very Next Day Delivery page is split in two. 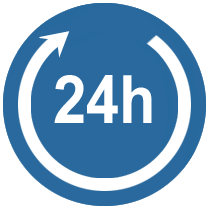 Shops who guarantee the 24-hour delivery, or next day delivery, are placed at the top. Shops that offer this but with earlier cut-off timings or no 24h guarantee will be placed in the back. Although delivery is fast, rapid, quick, …. It is important to look out for the cost of delivery. Most shops will have an average cost of £4, yet a lot of shops go above this amount. Where the Netherlands and Belgium focus on free delivery, UK webshops are still charging for this rapid delivery. We foresee that this will be eliminated as time passes. The web shops will either be including the cost of shipping in the price, or have a reduced fee for express delivery. Because too many people still pay for this option, the market is enforcing web shops to include this delivery cost.